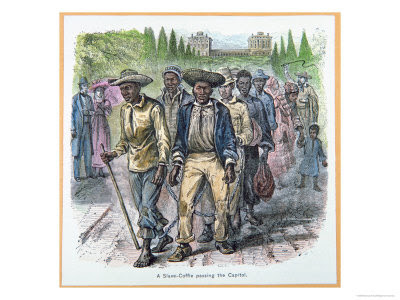 Wood engraving, captioned "A Slave-Coffle passing the Capital" and depicting slaves wearing handcuffs and shackles passing the U.S. Capital, meant to depict a scene ca. 1819. This image was intended to illustrate part of a debate in the U.S. House of Representatives in 1819, concerning the admission of Missouri to the Union. The representative from New York, James Tallmadge, Jr., proposed that as a condition of admission slavery not be permitted in Missouri "except of those already held as slaves." While the debate was going on, Tallmadge pointed out that the South wanted Missouri to be a slave state and that a "striking illustration of what the South" wanted was to be viewed at that moment in front of the Capital. Apparently, as the debate was in progress "a trafficker in human flesh . . . has passed the door of your Capital . . . driving before him about fifteen of these wretched victims of his power. The males . . . were handcuffed and chained to each other, while the females and children were marched in their rear, under the guidance of the driver's whip" (p. 265).